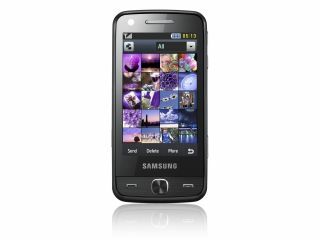 Samsung has got itself off to a good start to the week, by announcing the arrival of the world's first 12MP cameraphone. We know we recently brought you news of Sony's Satio – which also lands a 12MP punch – but the Samsung Pixon12 (M8910) will be out in Europe in June, unlike Sony's device which will arrive Q4 of this year. The Pixon12 is an update to the company's impressive Pixon M8800, which was released last year and packed an 8MP sensor. Features on the camera include a Xenon flash and Touch Auto-Focus tracking. The 'touch' means users can touch the screen to select what object they want to be in focus. The handset comes with a 3.1-inch AMOLED screen and will also record video at 720x480 resolution at 30fps. Also included on the Pixon12 are GPS and a FM radio. For all those who want internet on their phone, you will be able to log on using either HSPA or Wi-Fi. Images will be shot via a 28mm wide angle lens, which is more or less the sort of technology you would expect from a standalone compact camera. 12 megapixels seems to be a trend that most mobile manufacturers are latching on to, with LG confirming to TechRadar recently that it too is looking into making a 12MP handset.